Terry tells Daphne that Des's bed hasn't been slept in. Daphne can't believe it - Des hardly knows his girlfriend. Terry says that he does now(!) They giggle about the "Ramsay Street Romeo"! 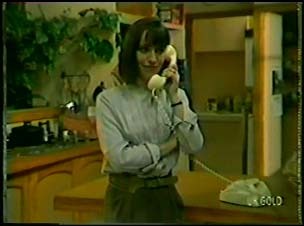 Daphne is on the phone for Shane. He says he can't come out tonight - he'd feel guilty leaving Max on his own. Daphne suggests asking Max along as well(!) Shane relents in the end and says he'll come - he'll buy Max a pizza and some beer to keep him sweet. When Shane gets off the phone, Max has burnt the toast. Shane tells Max off for continually having a go at Daphne. He tells Max that Daphne invited him too and Max is fed up that Shane said no - he has no food in the fridge. Des is still asleep on the beanbag at Joan's place. Joan wakes him up with a cup of coffee saying the kids have gone to school Des gives Joan a pash. Terry and Maria are talking about Shane and Max's living arrangements. Maria says she doesn't really mind being on her own. The phone rings and it's Robert Langdon. She tells him she had a wonderful night last night. She accepts another date with him. Jim comes in looking for Danny, but apparently he's on a detention. He was going for a game of squash, but Maria explains that Scott is on detention too(!) Maria is trying on a dodgy red dress for her date tonight. Jim sees a letter on the table and it's from Anna - Maria tells him that Anna is expecting a baby. Jim looks a bit upset but says he's pleased for Anna, she'd make a good mother. Maria explains that she's off to a Czechoslovakian play tonight. Jim wanders off to do some gardening. Terry comes in and tells Daphne she's had a rotten day at work. Paul comes in to pick Terry up to go and play tennis. He tastes her cooking and Daphne explains that Shane is coming round for dinner. Daphne asks Paul if she can hear wedding bells for him and Terry. She also tells him the gossip about Des not coming home last night. Just then, Des comes in and tells Daphne and Paul off for giggling. He refuses to give them any details about his woman. DES: I'm going to have a shower. Paul rushes in to ask if he can borrow the car. Jim teases him but eventually hands over the keys. Des is wrapping a posy of flowers and tells Daphne that his woman's name is Joan and she's great. Des heads off to meet Joan. 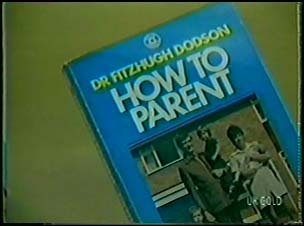 When Des has gone, Daphne finds a book by his briefcase titled, "How To Parent". She looks puzzled. Paul and Terry have finished their game. Paul suddenly gets serious and tells Terry that she makes him nervous - he never knows what she thinks of him. He says he could very easily fall in love with her, but he doesn't know if the feeling's mutual. Terry says she likes Paul a lot, but she's never sure of her own feelings - everything's really mixed up at the moment. Paul says he just wants to know if he has a chance. Terry kisses him. Maria and Robert have arrived home. He invites her to a guest house on the weekend, but she doesn't think she should. But she changes her mind suddenly and says she will come. Just then, Maria sees Shane going in to Daphne's. She says that Shane doesn't have a lot of time for her now he's left home. Shane has brought Daphne a present - after dinner mints. He gives her a bunch of flowers and says he's looking forward to the football at 8.30pm. Daphne isn't very impressed! Maria is still in Robert's car and sees Max getting out of a taxi. Daphne and Shane are having a drink and bargaining about watching the football. They kiss, but just then there's a knock at the door. Daphne is surprised to see Max there, dressed in a suit. MAX: Well, Daphne, I decided to accept your invitation, despite me son's offer of a free pizza. Max says he's brought some Chinese food and some beer as well. Shane is speechless, but Daphne keeps face and offers Max a drink. They all sit down in the living room rather awkwardly. Max asks Daphne how her work is and she says it's "on again, off again". Max laughs his head off. When Max has gone to get a beer, Daphne tells Shane to relax - Max is being really good. 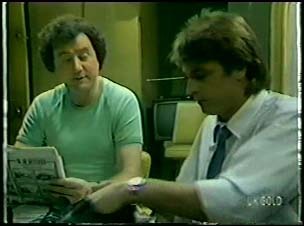 Just then Max picks up Des's book, "How To Parent" and loses his rag. Daphne insists she isn't pregnant or trying to trap Shane. Shane tries to intervene, but Daphne says it's about time she and Max sorted a few things out. She says her job is secure, damn well paid and she'll never have to trap anyone. Shane says the only reason Daphne asked him round was because she felt sorry for him and Shane feels sorry for him too. Max says he's sorry if he was wrong about Daphne, but he shouts at Shane that he can move out tomorrow and then storms out. DAPHNE: Well. Shall we eat? But Shane runs after Max. Max sees Maria getting out of the car with Robert. MAX: Oi! Get your hands off her! He goes over, taking his jacket off, but Robert punches him first. Max falls to the ground.